It's almost Easter and I'm taking the occasion to once again pay homage to eggs, my favorite ingredient to cook with! So I'm holding back on those Cadbury mini eggs this year (I'm happily munching on them straight from the bag) and instead of posting something sweet - like a cake or cupcakes - I'm talking eggs in a savory way with these very simple little egg and toast cups. What's cuter and more fun than an a little egg cup for breakfast or brunch! It doesn't even have to be Easter. I think these egg and toast cups are rustic, cute and casual, but a little bit special at the same time. The whole thing is portable and edible; it's essentially your egg and toast in one! The cup is simply made with lightly-buttered bread (white bread in this case), which becomes the cup or nest for the egg to bake in. It's really easy to make in your standard muffin tin and while the egg cups are baking in the oven for about 20 minutes, you can pull the rest of your meal together. I've wanted to make eggs in hash brown nests for a long time but it always sounded a bit labor-intensive and messy. When I saw this recipe from Martha Stewart for bacon, egg and toast cups, I had a feeling this was a simple route more suited for me. I opted to leave the bacon out of the cups to keep it super simple. I think it's easier (and better) to serve the bacon or any other accompaniments you want on the side. I don't think you need me to describe how these egg and toast cups taste but funny enough, the fellas insist they taste like deep-dish pizza! After a good laugh, I realize that the lightly buttered toast makes for a browned, flaky, almost pie-like crust that does call that to mind! And when you eat it alongside a slice or two of bacon, it can be reminiscent of the kind of deep-dish pizza they like to eat. How funny is that! So whether you make these little egg-toast cups as part of your Easter brunch, have them with some bacon, ham, or just on its own for a quick breakfast, I highly recommend it. I'm big on having some fun with our breakfasts! If you walk into a Hong-Kong style Chinese bakery, you won't find many buttercream-frosted cupcakes, brownies, or bar cookies. You're more likely to find plenty of simple egg-based cakes, buns (sweet as well as savory), and tarts. One of my favorite things to get from the Chinese bakery is a simple paper-wrapped sponge cake. They are light as air, soft and fluffy, and taste mildly sweet and eggy. At the Chinese bakery, these paper-wrapped sponge cakes are tall, probably 3 times the height of these mini cakelettes that I made at home using a regular muffin tin. To make the traditionally tall/large versions, you could buy specific molds made for the purpose or use a large muffin tin or try a popover tin. I've also seen it made using freestanding paper cups lined with parchment paper. 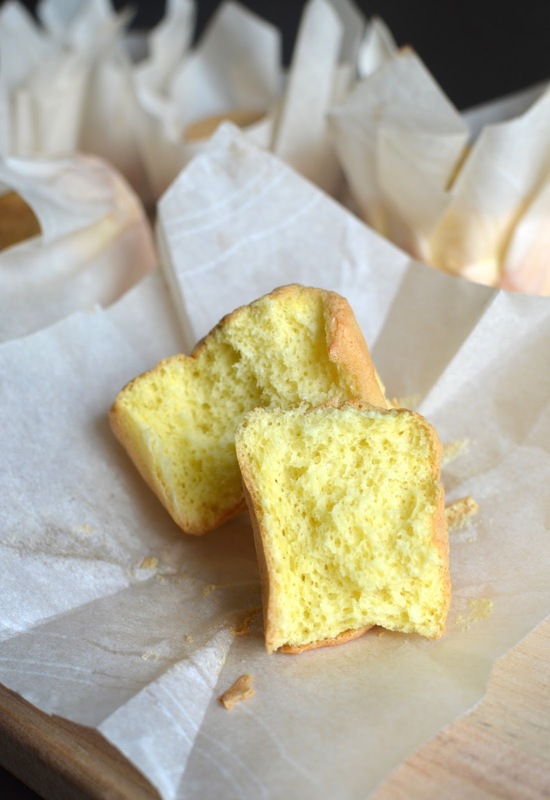 These little cakes are very much like my favorite chiffon cake, in a smaller, portable form. In keeping with my small-batch tendency lately, I made half a dozen of these little cakes and realized this is one instance where small batch might not be the way to go. They vanished in no time, and they make a great little afternoon snack if you want something sweet but not overly so. The little cakes are really light and fluffy. As a big fan of eggs in every form, I love this kind of simple dessert that's full of egg-flavor, lightly sweetened and boosting a hint of vanilla in the background. It may sound silly but I love the eggy aroma that permeates the house when I'm making something like this. I wouldn't mind if my house smelled like that all the time! This homemade version tastes just like the ones at the bakery. Texture-wise, I think I need to work harder at reaching the supreme fluffy/airiness of the ones I get from the bakery. I'll also own that size-wise, the traditionally larger ones make more sense. Because they are so light, a large one is probably just more appropriately portioned. With these cakelettes, you just want to eat three in one sitting! So the way I look at it, I need to either make larger ones next time or at least double the recipe. I get to talk about a couple of my favorite things today: breakfast and pancakes! They are familiar topics here because I truly love breakfast - it's what I look forward to when I go to bed at night! For me, weekday breakfasts are more about quick nourishment - they are important and enjoyable but not the true meal we get to make on the weekends when we have more time. Everyone is home and there's time to set the table and linger over a hot meal together to kick start the day; I never want to leave the breakfast table! The fellas in my house love pancakes so I make them often (still no waffle-iron here). While we already have a few favorite recipes, I welcome the chance to try something new every once in a while. Which brings me to these Norwegian pancakes, a recipe I've been eyeing from Sweet Paul's Eat and Make. These are thin unleavened pancakes, very much like crepes or Swedish pancakes. I honestly couldn't tell you the difference between them, if any, but whatever you call it - these pancakes are wonderfully tasty. They are tender, light, delicately flavorful on their own and a beautiful canvas for filling with jam, fresh fruit, Nutella, what have you. They were also surprisingly easy to make. I found the thin batter easy to cook and handle, and they cook up very quickly. When it comes to prep, the key is to let the batter rest for about half an hour before using. When it comes to serving, make sure to keep the pancakes nice and warm in the oven while you make the batch so everyone can enjoy them that way. My pancake-loving family and I gave these a big thumbs up. This is a great change-up from our traditional thicker American pancakes. Certainly, both kinds are great though I think there's something special about these thin crepe-like pancakes. It may just be that they're different from our typical thing, or maybe because they look delicate and harder to make than our usual flapjacks. Whatever the case may be, these are delicious and it's always nice to have some variety. Now that I have this easy recipe in my back pocket, I plan to make these pancakes a part of our weekend breakfast rotation. When those summer berries start to arrive at the farmer's market, I will be loading my plate up with them to enjoy on top of these delicious thin pancakes. My newly acquired addiction to homemade cinnamon rolls continues. A year ago, I discovered that small-batch cinnamon roll recipe and I've been hooked on making cinnamon rolls ever since! After that first sweet combination of chocolate and orange, I went on to make that crazy-delicious almond version and now, I made rolls with a Nutella and hazelnut filling. This was inevitable. I've been thinking about possibilities as far as fillings for this deliciously soft and squishy cinnamon roll dough ever since I first made and tasted it, and Nutella would always pop into my head. It's just too easy and tasty. Now it's done and I can be so happy that I made them. Seriously, what a treat! I think if you love Nutella like we do, I need not explain why these rolls were so good. But I have to give props to the cinnamon roll dough itself, a small-batch recipe for 4 rolls that I adapted from Oh, LadyCakes (who I can't thank enough for this, no matter the impact on our waistlines). It makes for such wonderfully soft and tender rolls that are like warm edible pillows encasing whatever sweet fillings you tuck inside! I feel like I have an ideal canvas to play with. In this case, it was Nutella and chopped hazelnuts, along with a dusting of cinnamon. It couldn't be easier. I'm crazy for nuts and a little texture in my desserts so I added toasted hazelnuts to give the rolls a contrasting texture as well as a nutty flavor. The cinnamon brings a hint of spice in the background. All in all, this filling couldn't be simpler and it's honestly getting altogether too easy to make cinnamon rolls to enjoy warm and fresh on a weekend morning! Given how delicious these are, we are more than happy to indulge. After a long week, this is the treat to start the weekend morning off right. 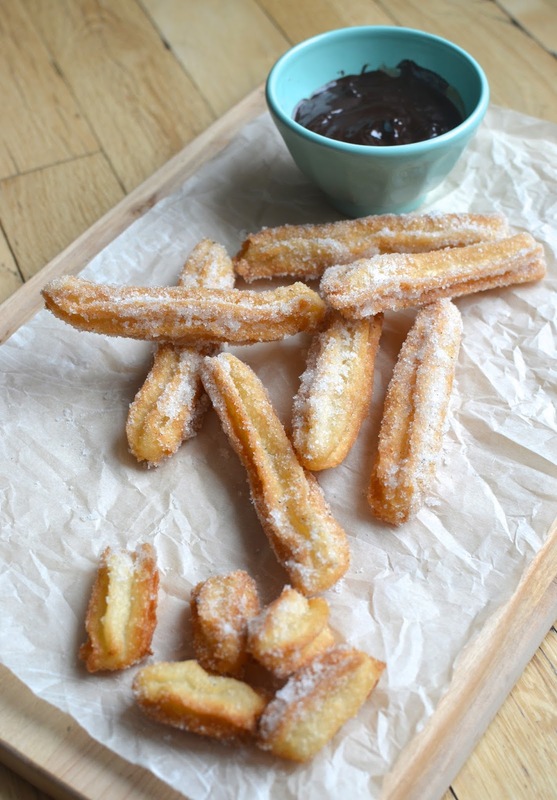 The last time we were here talking about churros, I called them one of my "fantasy foods". That would be something I might talk about or see a lot but, in reality, have never had or have rarely eaten. There are a lot of things on my "fantasy foods" list and some of them are very basic, like red velvet cupcakes. I feel like a fraud sometimes, having a baking blog but actually unfamiliar with so many things! But this is really a food "learning" blog, as in me learning all the time. As a picky eater growing up, I've broadened my tastebuds tremendously over the last few years (by my standards, at least) but I'm still a creature of habit and I prefer a sure-thing. I don't want to waste a single calorie these days (there was once a time when I never even considered it) so I stick with what I know and love. Most often, that means chocolate if we're talking about dessert (and that's generally what we talk about here, right?). That preference applies to cupcakes. And when it comes to cupcakes, I may find myself at a bakery admiring an array of them but for the most part, I'm there for the visuals. I love the look of cupcakes - the pouf of frosting, the colors, the sprinkles. I'll ogle them all and then walk away (that doesn't sound like fun, I know), or end up predictably asking for the "chocolate cupcake with ganache frosting, please". Yes, I live a sheltered life because I can't even recall the last time I had a taste of classic red velvet cupcakes! Maybe I shouldn't admit to this level of dessert ignorance but it is what it is. I got to thinking about this whole cupcake situation and red velvet in particular at my niece's birthday gathering recently. My sister had a dozen beautiful-looking cupcakes from Georgetown Cupcakes and I was looking at all the flavors and eyeing the one red velvet my sister had selected for herself. There's just something romantic about it and I was thinking I needed to sit down and enjoy a red velvet cupcake for a change. And lucky for me, I found the perfect way to try it with this baby batch of red velvet cupcakes with classic cream cheese frosting. 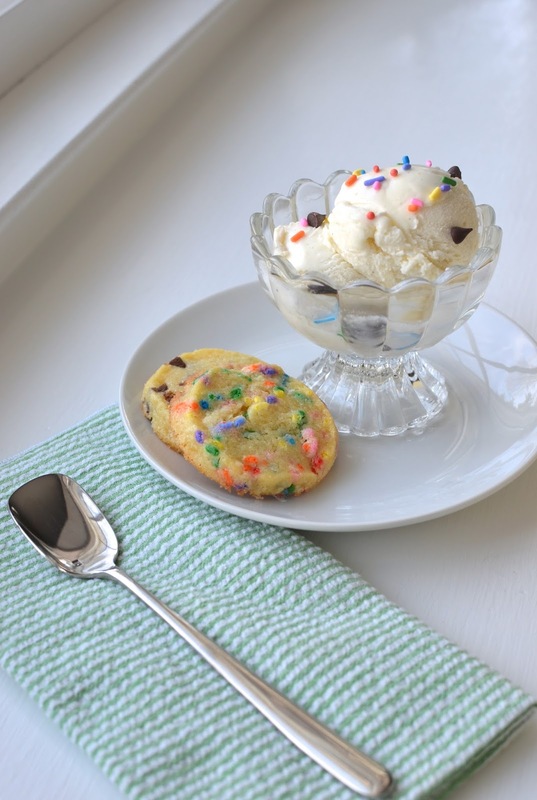 This recipe comes from Dessert For Two, a book that is right up my alley. I love baking in small batches so I can do it more often for my small family. I was really lucky to spot this wonderful cookbook recently and just a quick look revealed at least half a dozen recipes I wanted to bake right away. This is the first of that endeavor, a recipe that makes 4 red velvet cupcakes. I did very nearly turn these red velvet cupcakes into chocolate cupcakes. Maybe I did want to swap that classic cream cheese frosting with chocolate ganache frosting (my little guy suggested the same) but I managed to stay the course! I'm not a big fan of buttercream frosting but I can't complain about how easy the cream cheese frosting was to make, how luscious it was to pipe out, and how pretty it looks on top of that red-hued cake. I'm all about the cake and this is one good cake. The tang is a nice theme that runs throughout the red velvet cupcake. I can say that even without chocolate chips, the red velvet cake here was totally delicious on its own. I could taste a hint of cocoa against the slightly tangy cake. It was moist and tender - super tasty! My husband knows how to appreciate a classic. He'd have been very happy with plain red velvet - sans chocolate chips - and the tangy cream cheese frosting. Me, I'll take chocolate chips in my cake any day! But you really can't lose either way, whether you choose to include the chocolate or not. These biscotti bites are a very happy recent discovery of mine! Picture biscotti that does not need to be twice-baked, and in round, bite-size form. This is a fun, easy, and very delicious way to take a twist on classic biscotti (which I love). I found the idea for these biscotti bites from Martha Stewart Living's Jan/Feb 2014 issue. It really caught my eye given my love for biscotti so I promptly ripped the recipe out...and then left it to languish in my "things to cook" folder for over a year. I meant to try it during Christmas but it didn't happen but 'better late than never' certainly applies here! There's so much I love about these cookies. Taste - first of all, they're delicious! In my case, I went with one of my favorite biscotti flavor combinations, pistachio and orange. The original recipe is made with shredded coconut and grapefruit zest so you can see how you could very much customize the flavor to your liking. The original recipe has chocolate bits in the cookie itself as well as a chocolate coating at the base but I choose to only dip mine when it comes to the chocolate. Once in a while, I like to practice restraint when it comes to chocolate. 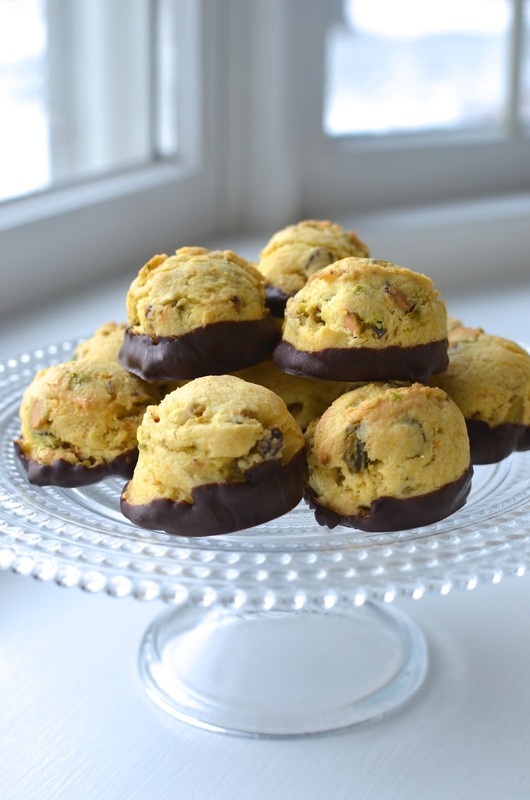 In all seriousness, I think the thin layer of bittersweet chocolate at the bottom of these cookies is enough to add richness and to complement the orange zest and pistachios. The cookies are good even without the chocolate. Texture is another key thing we need to talk about because I think taste and texture go hand in hand in making this a great package. I don't normally make biscotti with butter but I see the appeal after this. There's just enough butter in this recipe to soften the cookies to the liking of the majority of people (I think most prefer a softer texture than I do). More interestingly, there's ground cornmeal in the cookies to give it a grittiness and coarse texture that you associate with biscotti. It's like a little shortcut to the biscotti texture without having to bake them twice. Ease - these are easy to make and aptly called "speedy biscotti". No need to roll into a log, bake, cool, slice, and re-bake. Make the dough, scoop it out and let it chill for about half an hour before baking just once. You could get playful and make these tiny bites (the recipe suggests teaspoonfuls) but I made them more normal in size, just slightly over a tablespoon of dough per cookie. As someone to loves to bake, I don't necessarily mind the steps needed to make traditional biscotti so the real selling point for me here was just how tasty these are! 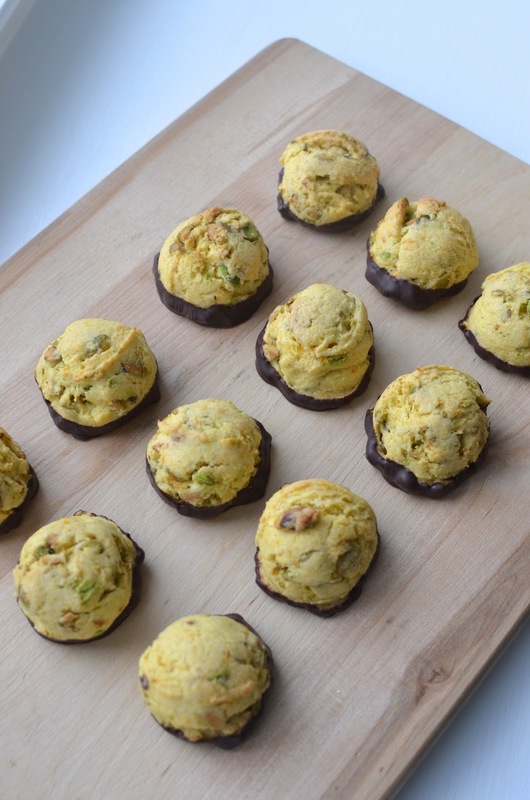 The texture is firm and crunchy but not too hard, the cornmeal adds a lovely element of texture, and there's plenty of flavor and richness from the pistachios, orange, and thin chocolate coating. I highly recommend this to any biscotti fans looking for a fun, easy, tasty twist to the typical!